S4.A.2.1.1: Generate questions about objects, organisms, or events that can be answered through scientific investigations. S4.A.2.1.4: State a conclusion that is consistent with the information/data. S4.A.2.2.1: Identify appropriate tools or instruments for specific tasks and describe the information they can provide (e.g., measuring: length-ruler, mass-	balance scale, volume-beaker, temperature-thermometer; making observations: hand lens, binoculars, telescope). S4.B.1.1.1: Identify life processes of living things (e.g., growth, digestions, respiration). S4.B.1.1.2: Compare similar functions of external characteristics of organisms (e.g., anatomical characteristics: appendages, type of covering, body segments). S4.B.1.1.3: Describe basic needs of plants and animals (e.g., air, water, food). S4.B.1.1.4: Describe how different parts of a living thing work together to provide what the organism needs (e.g., parts of plants: roots, stems, leaves). S4.B.1.1.5: Describe the life cycles of different organisms (e.g., moth, grasshopper, frog, seed-producing plant). S4.B.2.2.1 Identify physical characteristics (e.g., height, hair color, eye color, attached earlobes, ability to roll tongue) that appear in both parents and could be passed on to offspring. 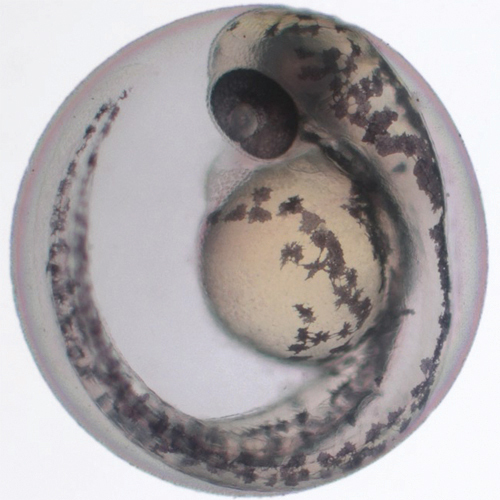 Students learn that in order to make small things (embryos) appear larger so that we can see them better, we need to use a microscope or hands lens. 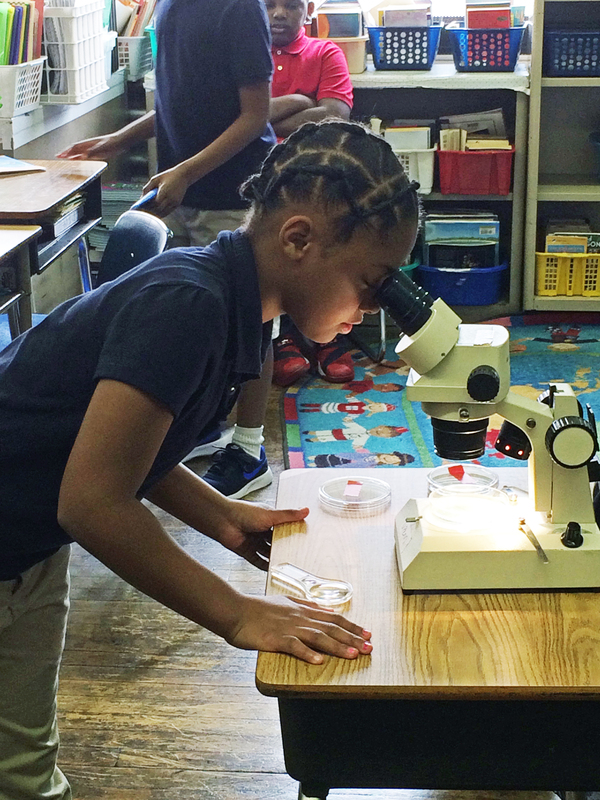 Students get 4 days of practice using both tools during their BioEYES week! 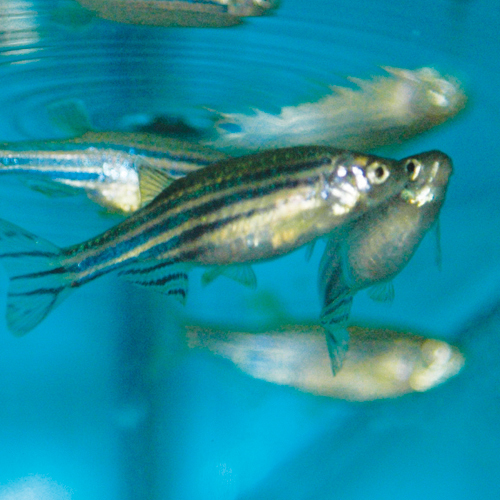 Adult zebrafish display dark stripes and dark eyes. 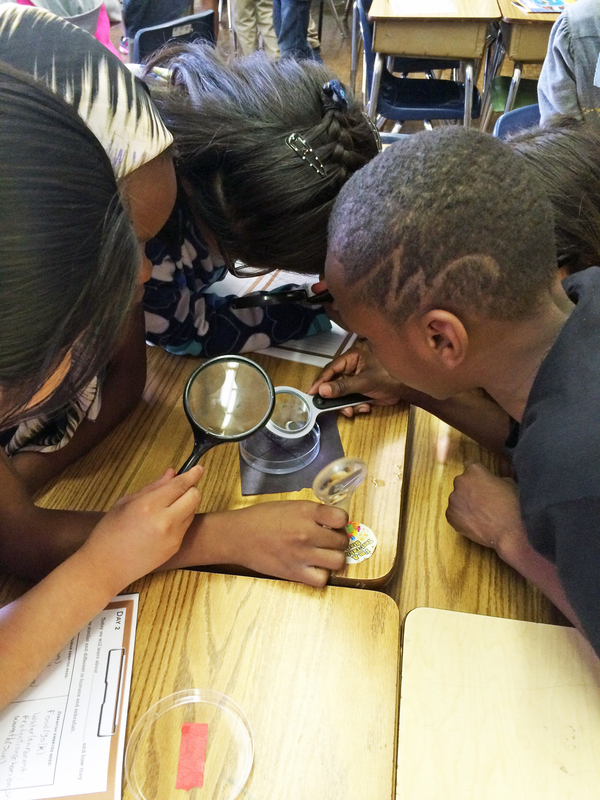 Students observe the inherited dark pigment forming in the larvae’s eyes and as spots on the body on Days 4-5.